Documentation of musicians is patchy, so only verifiable dates, or dates of performances (or advertised performances) have been given; it is possible that many of the names included here actually performed in other years as well. Composers have only been included if they wrote known works specifically for the gardens. Except where fuller evidence is available (e.g. for 1845) most of the secondary players are never named, so this list is by no means comprehensive. Addison, John (c.17661844) 'cellist, 1800f. Billington, James (1757-1794) Double bass. Recorded ar RSM as playing at DL and Vauxhall. Married Elizabeth Weichsel. Boyce, Dr. William (17101779) Composer, 1745f. Calkin, Pierre Jacques Piotry (1831-c. 1894) Violin, tenor and pianoforte. DL, and 'is also engaged for the approaching Season  at Vauxhall'. Eley, Mr. 1826. 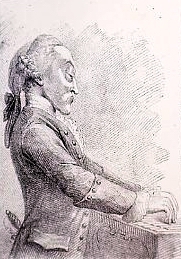 Possibly the Christof Friedrich Eley who led the Duke of York's Band c.1790, and composed music for it. Fischer, Johann Christian,(1733-1800) Oboe from 1768. Shown in Rowlandson's watercolour of 1784. Griesbach, Henry Dougan Dickinson (21 Jan 1811-?) The youngest son of Frederick Griesbach the oboist. His uncle, Henry, the cellist died in 1832 and he was a cousin of John Henry who was better known. He was one of the youngest of the thirty-three Griesbach cousins , all children of the five brothers in Queen Charlotte's private band. A violinist nad voice teacher he also played in the Philharmonic Orchestra in the 1850s and '60s alongside his cousin Adolphus. In 1855 he lived at 2 Alfred Terrace, Newington. 1845 first performance; 1846 joint leader concert band; 1849 Deputy Leader. Handel, Georg Frideric (16851759) 1740, wrote Hornpipe for Vauxhall. 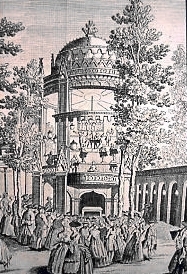 His statue by Roubiliac erected at Vauxhall in 1738. 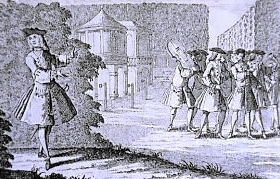 The Dead March from Saul was played regularly at the gardens, and annually on the anniversary of the death of Jonathan Tyers on 26 June 1767. Harper, T. jr. 1845. T. Harper was teaching trumpet at the Royal Academy of Music in 1838. Hebden, John (17121765) Principal 'cello and 2nd bassoon, from 1745. Nelson, Jacob (c.17051 July, 1785) Kettle drummer 17351785. Friend of Arthur Pond the artist, and lodged with him. Savoyards 1781 (French and Venetian Ballads), 1804f. Smethergell, William (17511836) Principal Viola. Tully, C. Horn Soloist, 1824, 1826. Played horn in the Philharmonic Society Orchestra, 1819. Manning & Bray Manning, Revd. Owen, and Bray, William, The History and Antiquities of the.County of Surrey, Vol. III of 3 (London: White, Cochrane & Co.,180414), p.489f.